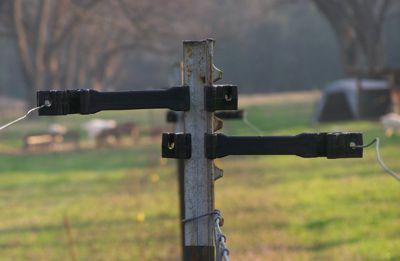 Both Sides™, the all new designed electric fence insulators. If you have been frustrated at having to purchase different fence insulators, one for each side of the T-Post then this product is for you. 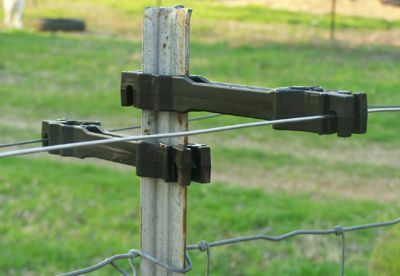 Now one electric fence insulator fits either side of a T-Post, saving time and money. Manufactured in the USA from high quality, durable, weather resistant plastic with UV inhibitor. For years now, electric fence insulators for t-post have been one sided. You need one insulator for one side of a T-post and a different T-post insulator for the opposite side. Invariably you would end up with too many of one fence insulator and not enough of the other. Now with the invention of the "Both Sides™" wire insulator one unit fits both sides of the post. With the new "Both Sides™" electric fence insulators you save time, money and frustration when installing an electric fence. The "Both Sides™" plastic fence post insolators are very easy to use. Simply snap it onto either side of the post an then install your wire into the slots. Have a question, give us a call. We are always happy to help our customers. Dealers, Retailers wanted, Call Us Today.